How to “Ace the Avalon”! A 35-year-old male with Pulmonary Fibrosis is admitted to ICU with rapidly deteriorating hypoxia. He does not improve with high-flow nasal oxygen and requires to be intubated. The patient is well known to the transplant team and is on the transplant list. VV-ECMO as a bridge to transplant is planned. Q1. What are the options for cannulation in this patient? VV-ECMO at the Alfred is usually initiated with the fem-fem configuration (see Everything ECMO 010: Keep calm and cannulate!). Other options include Femoral-Jugular cannulation, or a single vessel approach using a Dual-Lumen ECMO cannula (Avalon Elite® Bi-Caval Dual Lumen Catheter, Maquet). It may be possible to insert femoral guidewires under local anaesthetic prior to intubation in case he becomes impossible to adequately oxygenate after induction, in which case he can be “crashed on” to VV ECMO. However, this depends on time and skill mix available and is not routine. Q2. What is the benefit of using a dual lumen cannula in this patient? ECMO as a bridge to transplant is a controversial technique, and patients are at risk of significant deconditioning in the time period spent waiting for suitable donor organs to become available. A dual lumen cannula inserted via the internal jugular vein may allow patients to not only wake from sedation and be extubated, but also mobilise and engage in physiotherapy in an effort to minimise the deconditioning process. Q3. What are the main features of the Avalon Elite ECMO cannula? 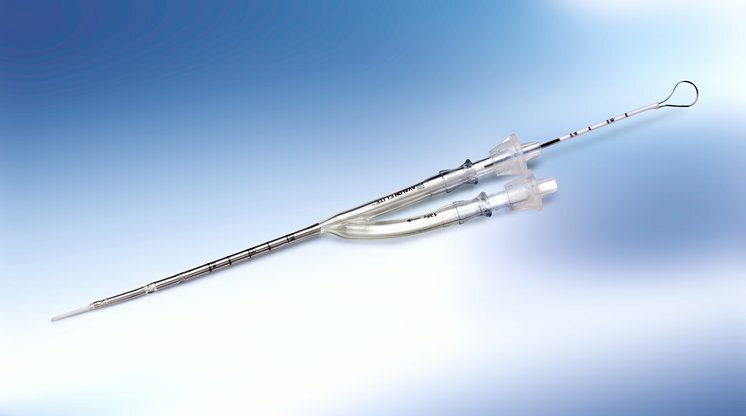 The Avalon Elite® Bicaval Dual Lumen Catheter (DLC) is constructed of polyurethane/silicon and reinforced with stainless steel, making it flexible, kink-resistant and radio-opaque. It is inserted via the right internal jugular vein, and exists in a range of sizes from neonatal to adult. It has drainage holes in the superior and inferior venae cavae, and a return hole which sits in the right atrium, and directs oxygenated blood across the tricuspid valve. Q4. What are the pros and cons of Avalon cannula insertion? Q5. You decide to cannulate the patient using a dual lumen cannula. What size of Avalon cannula will you choose? 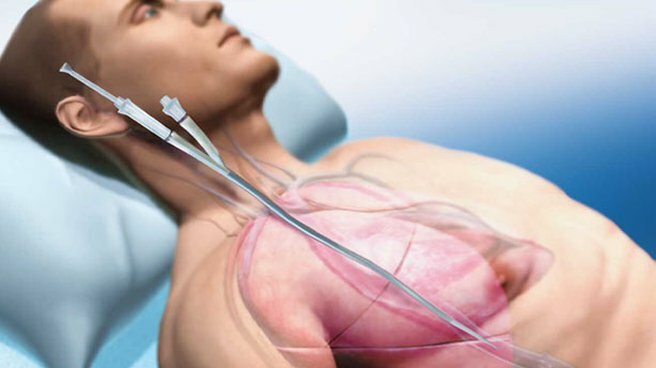 Typically, the largest cannula which can safely be inserted into the vessel will be used, in order to maximise the fraction of the cardiac output which enters the ECMO circuit. The cardiac output can be estimated in various ways including with echo, and may be significantly increased from normal in patients requiring VV-ECMO. A 31F Avalon Elite® cannula will achieve up to 5-6L/min blood flow, and will usually be suitable for an average sized adult male. A 27F can achieve 4-5L/min and may be suitable for smaller male patients or females, depending on body size and estimated cardiac output. Q6. What are the important differences between cannulation with an Avalon cannula and fem-fem cannulation? Avalon Elite® cannulation requires the use of several techniques that differ from usual femoral or IJV cannulation, and it should always be done with continuous imaging of the wire. This can be done with trans-oesophageal echocardiography (TOE), obtaining a bicaval view at mid-oesophageal level (see Echo-guided bi-caval dual lumen ECMO catheter insertion (Avalon Elite®)). If not available (e.g. during cannulation at a peripheral hospital), the guidewire placement can be viewed using the image intensifier. However; to ensure the optimal direction of the return jet the cannula position should be confirmed with echo as soon as it becomes available. Q7. Should you use a floppy or stiff wire during the insertion? Insertion of the Avalon Elite® cannula requires access to the inferior vena cava (IVC) from the right injugular vein (RIJV). The wire, therefore, needs to traverse the SVC and right atrium then enter the IVC. 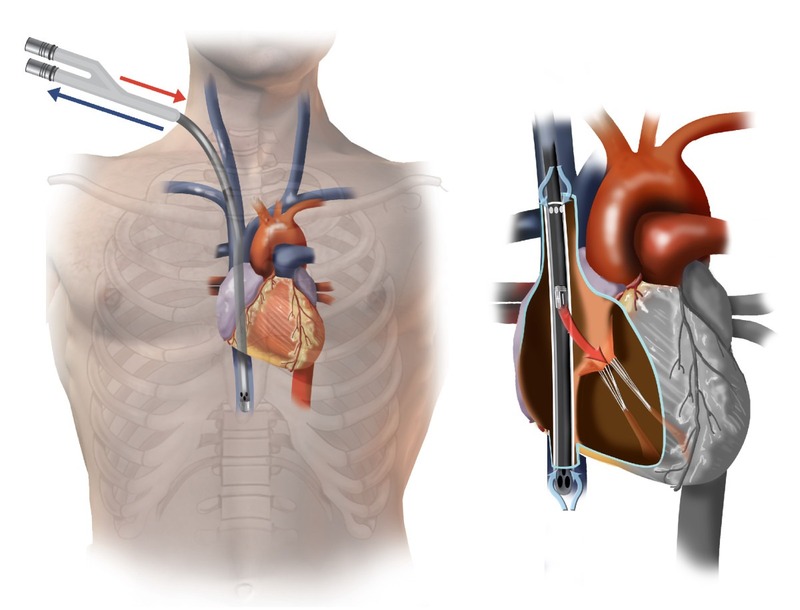 The guidewire provided with the Avalon Elite® cannula is relatively soft and pliable – making it difficult to manipulate and also prone to migrating into the right ventricle. This can lead to the sharp introducer of the catheter being directed into the right ventricle, resulting in catastrophic RV perforation. At the Alfred ICU, we initially gain access to the IVC with a floppy wire. We then place an exchange catheter, remove the floppy wire, and introduce a stiff wire into the IVC (e.g. Amplatz Super Stiff™ guidewire, Boston Scientific). This is all completed with continuous imaging as described in question 6. Q8. How should the cannula be secured? At the Alfred ICU we advocate a “no-suture” technique to avoid accidental cannula rupture. Instead, we secure all ECMO cannulae with GripLOKs (see Everything ECMO 018:ECMO Cannula Rupture!). The Avalon Elite® cannula usually needs to be secured up and over the patient’s head and for this reason it may be necessary to shave the head. All pressure points should be padded to prevent pressure injuries. Q9. What is the correct cannula position once secured? As shown below, with the return limb positioned anteriorly and slightly rotated towards the patient. If it is rotated around the other way, the return jet will not be directed towards the tricuspid valve. Daily nursing care of the cannula should also include a measurement from the skin in case the cannula migrates in or out. Correct position and orientation of the Avalon Elite cannula. Image Source: Maquet (Click image for source). Q10. What major complication is this patient at risk for during the insertion of an Avalon Elite® with fem fem ECMO already in place? Care should be taken when inserting a DLC when femoral access cannulae are already in place (e.g. when existing fem-fem cannulae are to be replaced by a DLC to allow mobilisation). This is because the cannulae will be in very close proximity and the negative pressure created by the existing access cannula can entrain air through the exchange catheters or Avalon Elite® cannula itself, allowing air into the ECMO circuit. This can cause massive air embolism to the patient, or significant air into the circuit which can cause it to stop (“air lock”) (see Everything ECMO 019: Bad Bubbles and VV-ECMO). Hirose H, Yamane K, Marhefka G, Cavarocchi N. Right ventricular rupture and tamponade caused by malposition of the Avalon cannula for venovenous extracorporeal membrane oxygenation. J Cardiothorac Surg. 2012 Apr 20;7:36. [article].